Submitted on: September 5, 2013 3:35:36 PM EST Polite and they work with you. Submitted on: September 5, 2013 3:35:04 PM EST It was great! Submitted on: June 15, 2012 6:38:56 AM EST Restyle Tile and Stone L.L.C. I would never want to rent a unit anywhere else. We have been thru several storage companies but this one we are going to stay with for a very long time. The service is exceptional!! Thanks guys!! Shakopee, MN. Submitted on: May 12, 2012 7:26:53 PM EST I am very pleased with my services at the mini storage. The guy that helped me was so nice, speedy and more than willing to help me. I will be recommending this storage facility to everyone I know. Thank you for letting me rent a unit! Submitted on: April 30, 2012 2:02:27 PM EST It is clear why Kevin was brought in to turn this place around. His laser focus on customer service rivals anything I have experienced. 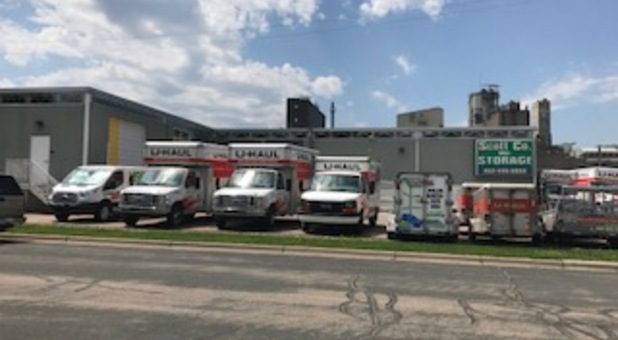 I recently rented a 4 x 8 U-Haul trailer and had some unique requirements that involved working with a U-Haul dispatch agent. Kevin took the bull by the horns, coordinated it to perfection, and negotiated it at a fair price. His feedback and follow-up was timely and spot-on. He knows his business and is a pleasure to work with. Well done, Kevin! Submitted on: April 22, 2012 10:09:11 AM EST Very appreciative of; 24x7 access, cleanliness, and staff. Would like to see an increase in number of 'push carts' available. Thank you! Submitted on: April 21, 2012 1:46:11 PM EST Scott Co. Mini Storage is clean and convenient. I have that piece of mind that my belongings are safe while being stored there. Submitted on: March 7, 2012 11:49:59 AM EST Love this storage facility. I looked around for several before deciding because I store very expensive medical equipment. Scott Co mini storage was my choice because they are clean, safe, well lit, and Kevin is great! I will continue to store my stuff here as long as I need to. Thanks!!!!!! Submitted on: January 23, 2012 9:53:15 AM EST Scott Co Storage is the most convenient storage that I have ever had. It is accessible when I need it and I know my belongings are safe. Highly recommend it! Submitted on: January 23, 2012 9:40:44 AM EST www.myrestyletile.com We have been renting at your facility for a while now. We have been very pleased with not only the customer service but everything the facility has to offer. I would not want to rent a storage anywhere else but here. I would recommend anyone who is storing rent a storage unit here!! Thank you. Submitted on: January 3, 2012 6:54:38 PM EST Scott County Mini Storage is a great place to store all your belongings. It is clean and well maintained, and the staff are always helpful and nice. Submitted on: January 3, 2012 9:47:49 AM EST Scott County Mini Storage has been very insightful and helpful with my storage needs. Access to the facility is easy, as well as clean and safe. Submitted on: December 23, 2011 2:21:58 PM EST Stevevaleri.com Our storage needs and customer service have always been excellent! Submitted on: December 19, 2011 8:21:53 AM EST I'm very happy with the great service at Scott co. Mini Storage!! Submitted on: December 1, 2011 4:36:41 PM EST Have had a unit here for several years. It is very clean and the temperature is always good. The staff are friendly and helpful. I would not hesitate recommending this storage facility to a friend. Submitted on: November 30, 2011 10:15:19 AM EST Very good service!! Thank you!!! Submitted on: November 16, 2011 9:21:01 PM EST Kevin is great to work with at Scott Co Storage. He is always friendly and checks in with us to see if we need anything else. Submitted on: September 9, 2011 9:00:30 PM EST www.myrestyletile.com I love the convenience of this storage. It’s everything we wanted for our storage unit. And you get that personal one on one service which is wonderful. I would recommend this storage unit to anyone and everyone! Submitted 7/23/11 9:27:11 PM EST Scott County Mini Storage is a great place for your storage needs. We've been a customer here for years and it is always clean, maintained, and the staff are always helpful and nice. Check them out if you need a storage space. Submitted 3/5/12 Staff is friendly and helpful. The facility is clean, dry and well-lit. It has a drive-in area and a loading dock with dollies, etc. Submitted 4/29/16 It was great! Submitted 5/8/13 Polite and they work with you. Submitted 6/23/13 The staff were very welcoming and easy to work with.They showed me my unit, how to use my password to open the door. The facility was very clean. Very clean. Great knowledgeable management. Submitted 2/25/14 Managers were great and very helpful. Submitted on 6/29/14 very clean and very safe area. Submitted 11/20/14 Nice and clean facility. The gentlemen at the office were a big help and answered all the questions I had. We returned a one way rental here and also rented a storage unit. Submitted 4/1/15 Kevin was very helpful and super accommodating. The facility is clean and very well maintained. A great place to store your stuff! Submitted 4/27/15 They were very helpful showing me around and explaining the rules, etc. Very friendly. Should have waited until 5/1 as I could not move in until then, so my prorated April was kind of a waste. Submitted 7/2/15 Excellent customer service. Very helpful in getting me into the unit size I needed. Submitted 10/22/15 Very friendly staff. Staff explained everything regarding the storage process. The storage facility was clean and well lighted. My decision was based on the security and the climate control feature. Submitted 12/2/15 I was impressed by the cleanliness, the lighting, and the security of the facility. Submitted 4/1/16 Excellent in every way. Submitted 5/31/16 Very clean and well kept facility! I wish the inside parking were a bit bigger like it used to be. Excellent customer service too! Highly recommend this storage place. Submitted 5/31/16 Kevin is VERY friendly and thorough with the process of entering the facilities both when the office staff is on site and when they are not. It is clean, brightly lit, and feels/looks safe! Submitted 6/12/16 The staff makes the difference. They were very helpful and attentive. Submitted 6/14/16 Very clean and very new storage area for us to move in. Very helpful and friendly staff on site. Submitted 6/15/16 The online reservation process for Scott County Mini Storage is second-to-none. Easy and practical. The staff is gracious and goes out of their way to satisfy the customer. Outstanding! Submitted 6/20/16 Great place to rent from, the staff was very professional and knowledgeable and the location was clean and easy to access. The guys were very helpful which made for as quick of a trip as it could have been! Thanks again for a very positive experience and see you next time I rent!! Submitted 6/27/16 They were great. Everything went perfect for me. Submitted 7/10/16 Friendly helpful staff. Very Clean building with excellent access. Submitted 7/19/16 I have been a customer multiple times at this facility. The manager, Kevin, has always been friendly and very helpful! Submitted 7/27/16 Unit was cleaned out ready. Helpful attendant made sure I was all set before I left. Facility was clean and easy to access. Having carts available was helpful. Submitted 9/2/16 The guys at Scott County Mini Storage are first class!